According to recent statistics, workplace productivity is declining. Employees are less engaged, taking more sick days, and are increasingly turning to the internet as an escape from work. To reverse this trend, consider how important the office desk is in improving productivity. When you think about the most important tools at your job, what comes to mind? Your computer is probably at the top of the list, followed by your phone. But what do these devices rest on during the day? 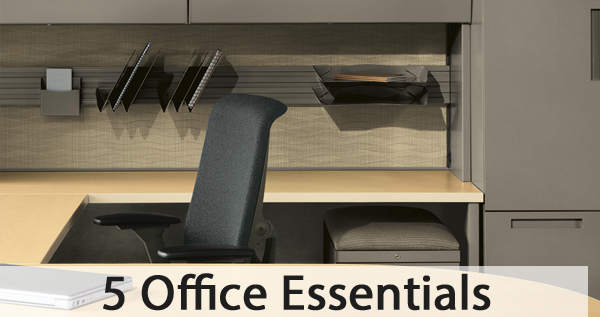 Your desk and chair represent two of the most important office components. Together, they create your work space. But what can you do to maximize this space? Height-adjustable desks have a number of benefits. 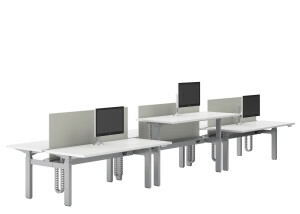 Users can sit or stand alternatively throughout the day. This not only improves comfort, but also enhances health and wellbeing. We all know that sitting for hours on end is bad for your health. By being able to stand and continue working, employees can improve their circulation by simply moving around. This increased activity is not only good for the employee, it also improves productivity. More movement means more blood flow. And more blood flow means more oxygen getting transported through the body. This oxygen is necessary for our mood and creativity. If your workplace allows some personalization, use this to your advantage. While things like motivational posters and calendars will boost your mood, other elements may boost your productivity. First, how’s the lighting at your office desk? If you’re not near a window, or you feel yourself squinting to see your screen, a new light might help. Something as simple as a desk lamp may improve your mood by providing light therapy. Especially during winter months, this can be a huge help. Also, consider adding some greenery to your space. A desk plant will help purify the air around you, which is a plus. And research shows that the color green increases productivity – a major benefit! Even if you don’t have a green thumb, there are many plants out there that do well with little care. Air plants, cacti, and succulents require very little water or attention, making them perfect for the office. While open offices have been gaining popularity, privacy is extremely helpful for productivity. Think about it – if you had a large project to finish, would you want to work with fewer distractions or more? When designing an office desk space, even a collaborative one should have some private stations available for important phone calls, meetings, or simply to get things done. Noise canceling headphones go a long way, too! Designing your office all comes down to improving functionality. Think about each employee and what their role entails. If they’re at their office desk all day, the flexibility of a height-adjustable desk is important. If employees are frequently meeting with other associates or customers, they should have a desk large enough to accommodate everyone and some privacy for important conversations. Designing a productive workspace takes time and skill, but you don’t have to go it alone. See how we help businesses with office design and planning to improve performance. 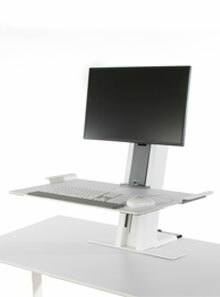 Altitude Height-Adjustable Desk by Allsteel. Did you know that sitting for extended periods of time can actually kill you? Perhaps you’re aware of some of the risks of sitting throughout the day. Maybe you even get up and walk around a few times during the day. But, even if you spend hours being active, after sitting all day at the office, you’re still at risk. The risks are the same as if you didn’t move all day. Surprising, right? Whether you work from home or in an office setting, it’s time to wake up and take your health seriously. Buying standing desks or focal upright chairs are excellent options to avoid these risks. And have become increasingly popular in office settings. You may not be aware of how detrimental sitting can be for your health. Keep reading to learn the benefits of using a sit-to-stand desk at your office or home. The American Cancer Society states excessive sitting can enhance your risks of cancer. This is only one of many studies that have concluded the same thing. This study concluded inactivity is linked to more than 173,000 cases of cancer. 49,000 cases of breast cancer and 43,000 cases of colon cancer each year in the US included. According to another study, sitting can increase your risk of cancer by an alarming 66%. If every office invested in standing desks this number would decrease majorly. It could be a lifesaving move for you and your coworkers too. Who doesn’t want to be more productive during the day? Of course, we all do. But what happens when you’re plagued with distracting neck and back pain all day? A study showed that worker’s performance was affected when they were in discomfort. In this study, only 38% were able to focus on their work. And 37% felt they weren’t doing their best work because of the discomfort they felt. A sit-to-stand desk is a surefire way to be more productive during the day. This is why more offices are converting to standing desks — nobody wants an unmotivated employee! Chances are if you work a 9-5 sedentary job, you’ve felt a sore neck or back at some point. But do you realize the long-term toll it’s taking on your body? Most of us aren’t using correct posture while working, and tend to get ”computer hunch”. If it’s not scary enough that sitting can cause cancer and severe neck and back issues — the other diseases you’re at risk for should be downright terrifying. “As extreme as it may sound, sitting for hours each day can cause diseases like diabetes, obesity, cardiovascular disease, and even death” states Dr. Busch. This can be avoided by investing in something like a sit-to-stand desk and being more active. They’re saying ”sitting is the new smoking“. It’s become an epidemic that many people aren’t even aware of. Most Americans sit an average of 7 hours a day on a computer. That combined with the amount of time we sleep is a shocking quantity of time to be sedentary. Standing desks are all the rage now, as well as other comfortable office chairs, that can make a tremendous difference to your health. If you’re tired of slouching and having neck or back pain and ready to transition into something more suitable, come visit us or contact us today to view our sit-to-stand desk options. Looking for computer desk ideas? You’re in the right place! There are dozens of potential computer desk ideas, ranging from “extremely zany” to “totally functional and designed to make the user more productive.” Where you fall will depend on your personality, but here are 9 cool computer desk ideas to consider. Minimalist computer desks can be a good play for some work-from-home types because they reduce distractions and provide an overall sense of calm and effective organization. 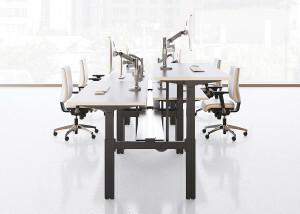 Have you tried AllSteel desks? Computer desks — well, long before computers — used to have a panel that lowered to become the writing surface, often called a portfolio desk. These went out of style because of the inconvenience of moving all your papers to lift the portfolio up again. But now it might attract some attention from potential clients as “classic,” right? The Gunlocke furniture line is comprehensive and includes conference tables, AV cabinets, credenzas, and even tables. But the desks are traditional and elegant. Many of our clients have viewed them as completely tying together their office. 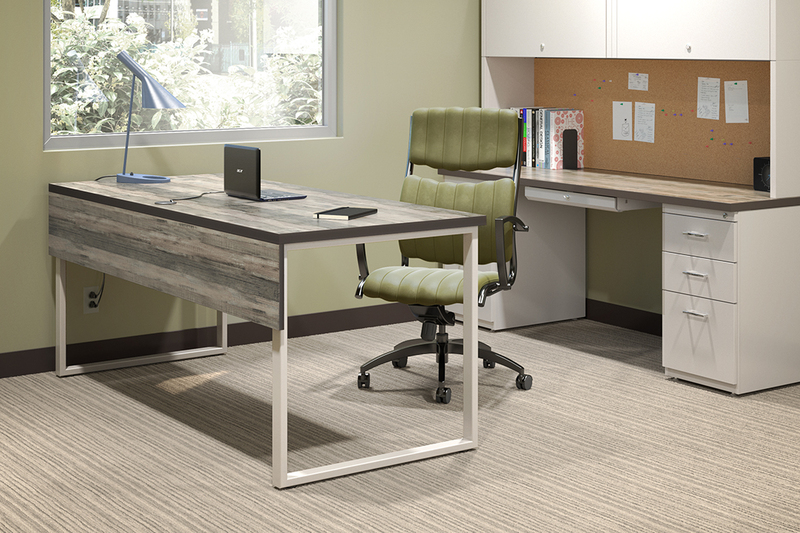 The Hon brand‘s Voi series combines durable steel with solid and woodgrain laminates to great a desk that’s striking, architectural, and very well built. That’s what happened at the NYC-based offices of digital media powerhouse Gawker, who forego some traditional desks and chairs and offered a large roof deck — once called “straight out of the Matrix” — where employees could work. It’s not quite a desk, but lying around wherever works for some, of course. National is a top-flight manufacturer of office furniture. 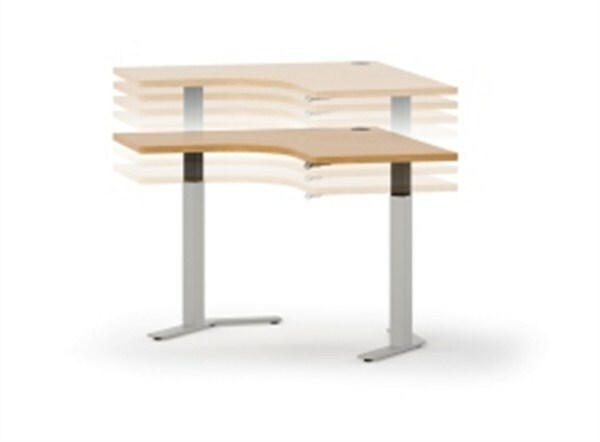 The office desks tend to have durable laminate tops for specific application needs. One of the best ways to vary out your computer desk ideas is to get flexible with options for the top, which is why you should consider TablEx. Need to Know the Tips and Tricks? Buying office furniture — whether for an established company, a startup, or an individual venture — is tricky. That’s where we come in. We try to make sure you get the most bang for your buck on any furniture purchase, using a process we’ve perfected across hundreds of clients. Remember: we don’t think of it as simply selling office furniture. We create spaces. So whichever of the above computer desk ideas you might be considering (or something else entirely), why don’t we help out? Studies show that those of us who spend the majority of our day sedentary are probably doing serious harm to our long-term health. Most of today’s jobs require a lot of time spent in front of a computer. On top of that, for many of us, most of our free time is spent engaging in sedentary activities as well, such as watching TV and playing video games. Even if you exercise regularly, there are still many hours in the day spent in a sedentary position. Research shows that the body’s metabolism slows down when major muscles — like your back and legs — aren’t moving frequently and regularly. Findings indicate that people who sit the majority of the day have unhealthy levels of cholesterol, blood sugar, and triglycerides — which can lead to weight gain and an increased risk of diabetes, heart disease and other health problems. Fortunately, finding a solution for this unhealthy behavior is fairly simple. Researchers have found that workers who regularly broke up their sedentary time with movement had a healthier body mass index and lower levels of triglycerides than people who didn’t take breaks during long periods of sitting. If you would like to incorporate some healthy behaviors into your work day, simply taking some breaks to move around and get the whole body moving can make a huge difference. Here are some suggestions to get out from behind your desk and move, so you can begin incorporating some healthier habits into your workday. Set a timer to remind yourself to at least stand up and stretch every hour or so. Take a quick stretching break every time you cross something off of your to-do list. Take walking meetings — instead of sitting down for one-on-one meetings take a stroll around the block. Stand up when someone enters your office to chat or even if you’re on the phone. Take the stairs instead of your building’s elevator. Park on the far end of the parking lot. If you work from home, use the breaks between tasks or cell phone time to walk up and down your stairs. At Workspace Solutions in Fort Wayne, we have a wide variety of ergonomic office furniture that can help you incorporate some healthy habits into your workday. If your office could use some change for the better, our office planners can help you design an office space that works for you. A few years ago, health experts began to discover the benefits of using a standing desk at work. After all, the effects of a sedentary lifestyle include many conditions such as weight gain, spine problems, back pain, heart issues, and many more! If you have been thinking about trying to include some healthy habits and better ergonomics into your work day, consider a standing desk. 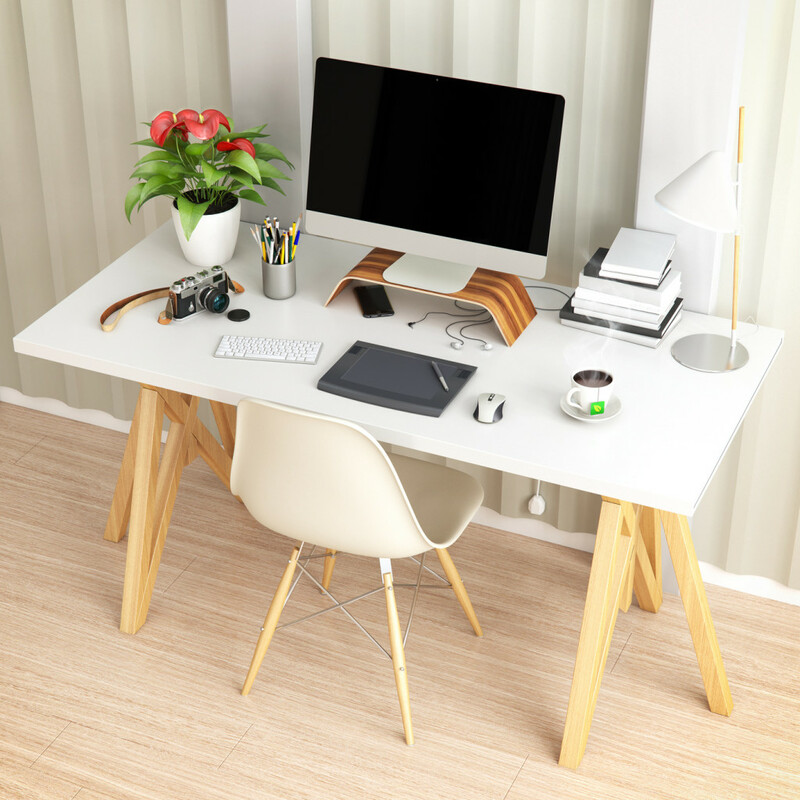 Before you decide on whether or not a standing desk would make a good addition to your office furniture, there are some things you might want to know. Many researchers claim that continual standing is actually more beneficial than regular exercise. Exercising has proven benefits, of course. But those who stand at work gain more benefits from the constant (though almost non-perceivable) increase in muscle activity that standing encourages. Simple, frequent movement may have longer term benefits than regular exercise. In order to maximize your comfort and ergonomics while standing at your desk, your monitor should be at eye level, and your desktop should be at the height of your hands when your elbows are bent at a 90 degree angle. If you decide that you would benefit from a standing desk, there are some things to keep in mind in order for you to get the most out of your decision. First, don’t just immediately begin standing for 8 or 9 hours a day. In order for your back and leg muscles to adjust, it is best to gradually work up to a full day of standing. Because you will most likely want the option of sitting, it might be best for you to invest in an adjustable desk. In order to allow the option of sitting, there are many desks available from quality office furniture manufacturers like Hon, Allsteel, and SurfaceWorks that adjust to a custom height either electrically or manually. Still, another option is the Quickstand from Humanscale. This stand sits on your existing desk, and allows you to raise and adjust the height of your keyboard and monitor; allowing you to turn your desk into an ergonomic standing desk quickly and effortlessly. Whether you need an adjustable sit-to-stand desk, or just would like to add a standing option to your existing desk, Workspace Solutions in Fort Wayne can help you find any kind of desk you’d like. They are experts in space design and ergonomics and will help you to make sure that your office furniture is providing maximum comfort, boosting your productivity, and promoting your overall health. Is your Office Furniture working for you? The furnishings and accessories in your office space can have an impact on your productivity, efficiency, and even your physical well-being. It’s important to understand the functions you require from these essentials — and to invest in items that are both designed to meet these functions and built to last. Here are some things to look for as you decide if your office furniture is helping — or hindering — your workplace productivity and happiness. Is your Desk working for you? There are endless amounts of options when it comes to office desk sizes, shapes and features. The style you would like (e.g. traditional, contemporary, solid wood, etc) along with your budget are important factors in making your choice. But equally, if not more important is to consider how you will be using the desk. Does it need to fit only a computer or will other types of work like drafting blueprints or sorting and organizing paperwork require more space? The height of the desk is also an important element when considering comfort and usability. Are there options that need to be included like drawers, hutches, shelves or extensions? Will the desk fit in the office space and allow room for other necessary furnishings? An adjustable chair is best for use at the desk — allowing the user to change its features for maximum comfort. Adjustable features may include: height, tilt, back angle, seat angle, and lumbar support; along with options like arms, castors, and the variety of upholstery material. When choosing an office chair, it is important to keep in mind which features you will need in order to keep you working hard all day, while maximizing comfort. Is your Storage Space Organized? Even in our computer focused era, almost every office is still going to require some system for organizing and storing papers and files. Piles of unorganized paperwork can waste your time and increase your frustration level. Options for organization could range from large lateral filing cabinets to more simple desktop organizing trays. Don’t forget a wastebasket and recycling bin as key components of paper management. 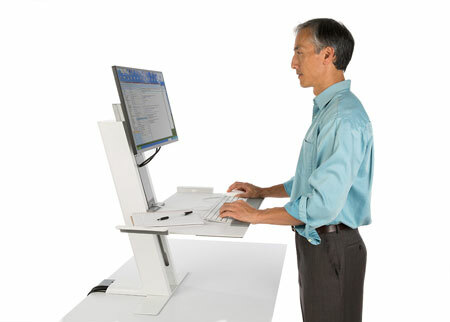 As desk height and an adjustable chair are important for workplace comfort, certain computer accessories can also increase productivity. Ergonomic options such as an adjustable keyboard drawer, a wrist rest in front of a desktop keyboard, or a riser to place the monitor at proper viewing level can all contribute to a more comfortable and efficient work area. Does your Office have Proper Lighting? Both comfortable ambient lighting and appropriate task lighting are essential to a comfortable office space. Poor lighting can lead to eyestrain, vision problems, and reduced work performance. Computer work can be particularly visually demanding under improper lighting situations. Overhead lighting should be low or glare free. Task lighting lamps should be adjustable, low-glare and located in a convenient position appropriate for your tasks. At Workspace Solutions in Fort Wayne, we can help you select and prioritize your office furniture based on our years of experience helping a wide-range of businesses design and furnish their workspaces. We offer only products from manufacturers that we know offer the best quality and value. Let us help you design your office space for maximum efficiency, usability and comfort. 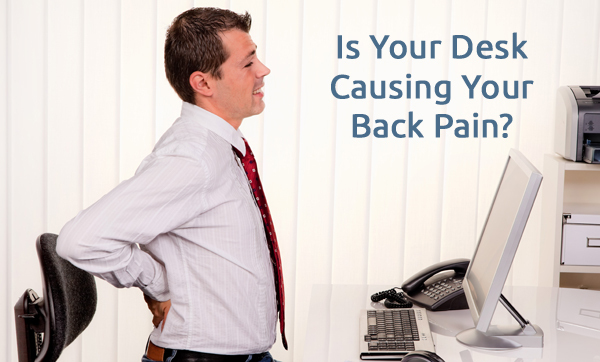 Is Your Office Desk Breaking Your Back? Many of us work at jobs that require spending a large part of the day in a sedentary position in a chair, in front of a computer. This actually places a lot of stress on our bodies and can even lead to the development of physical pain and ailments. OSHA (The US Occupational Safety and Health Administration) defines working environment ergonomics as: “The Science of fitting workplace conditions and job demands to the capabilities of the working population.” If your desk was set up without any consideration to ergonomics, it may be contributing to — or causing — a range of aches, pains, and even injury. Laptop use at the office is on the rise. Unfortunately, the ergonomics in laptop design are poor — if the screen is at an appropriate height and distance, the keyboard is impossible to use, and vice versa. If you work at a laptop for a significant amount of time, add an external keyboard or monitor so that less stress is placed on your body and eyes. Keep in mind your office chair and desktop height, as described above, for the least stress possible. Your workspace arrangement may be putting more stress on your body than you realize. The knowledgeable professionals at Workspace Solutions in Fort Wayne can help you identify the best office furniture and designs for a more ergonomic office space and improved work flow. Our goal is to help you work better — more efficiently and more comfortably. It has been said that a messy desk is a sure sign of a creative mind. 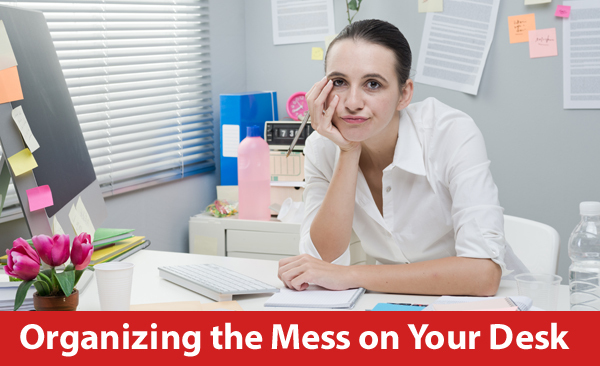 While that may be true, a messy desk is also a sign of disorganization, chaos, and stress. If you find yourself feeling frequently overwhelmed and stressed, the chances are that a good old-fashioned desk cleaning will get you back on the path to serenity. Here are a few tips you can use in order to get rid of the mess on your desk so you can maximize your productivity, efficiency, and even your attitude. If your desk is cluttered with papers, the first and most important step is to go through these papers and find a place for them. It helps to organize the papers into three different groups; “Current,” “Archives,” and “Recycle.” If it is an item or project that you are currently working on, file it in the “Current” folder. If it is a document that you don’t need to have on hand, but still need to keep on record, file it under “Archives.” And thirdly, if there are papers that you never need to look at again, go ahead and get rid of them! You will probably be surprised at what you don’t even need anymore. Many times in a day, I find myself grabbing a sticky note, and jotting down a quick note or phone number. It never fails, that by the end of the day, my desk is littered with sticky notes. Rather than your desk becoming an ocean of sticky notes, grab your phone and take a picture of any notes or phone numbers you might need, and then throw the hard copies away! Chances are, when it comes time to need those notes, you are more likely to have your phone on you anyway. On every cluttered desk sits an army of unused office supplies. Your desk should have a certain “hierarchy of needs.” Keep track of which supplies you use most. If there is an item you use most, keep it in closest proximity, on the side of your dominant hand. Likewise, if there are any that you hardly ever use; toss those babies back in the supply closet, like it’s the Island of Misfit Toys. If you have to get up from your desk to throw something away, chances are you probably won’t throw things away as often. Because of this, simply having a trashcan within arm’s reach can severely diminish mess. The best defense is a good offense! And by that I mean, if you don’t have a place for every single item that comes across your desk in a day, those things tend to just stay right there on your desk. Without a doubt, the most important factor in maintaining an organized workspace is having plenty of storage, and keeping it well organized. If you lack storage space, give Workspace Solutions a call. They have a wide variety of storage solutions including under the desk storage systems, lateral files, storage towers, bookcases, large filing cabinets, and more. Workspace Solutions has been helping people around the Fort Wayne, Indianapolis, South Bend and Warsaw areas get organized for years. To find out what we can do for you, give us a call today at (260) 422-8529. What’s New in Office Furniture? As time goes on, new ideas in technology and trends continue to develop. The same goes for office furniture. Quality office furniture manufacturers are always coming up with product lines better than the last in order to improve office planning, design, and productivity. In order to stay ahead of the curve, here is a quick guide to some new products and lines that can be found at Workspace Solutions. At the forefront of American-made office furniture, HON creates quality office furniture that is guaranteed to last. Their contemporary designs and superior workmanship have made them one of the leading office furniture manufacturers in the United States. New to the HON line of products is the Basyx Collection; a collection of office furniture ranging in items from office chairs to tables and desks. The idea behind the Basyx collection was to bring the highest quality and most modern look available at the lowest price possible. The highly reputable HON company has now made high quality office furniture available for those on a budget. Not only is this the best deal around, but the Basxy collection is guaranteed to bring a sleek, modern look to any contemporary office. 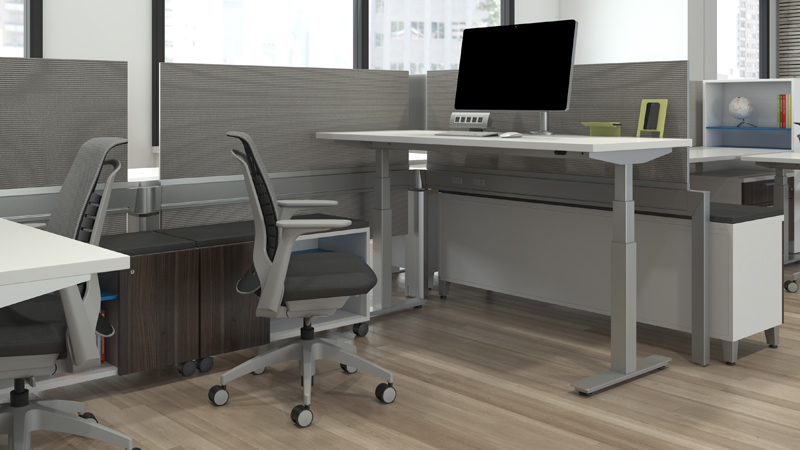 When it comes to office furniture, Allsteel is leading the way in its revolutionary designs. Based in Iowa, Allsteel produces quality, American made office furniture in a new, creative way. Allsteel’s new product line, the Gather Collection, transcends all other styles of furniture. Their unique philosophy on the importance of office atmosphere and collaboration is revealed in the Gather Collection. This line highlights the importance of comfort, while also creating a highly productive work environment. The unique design of the newScooch chair allows you to literally pull up a chair anywhere you might need it. It is extremely lightweight and portable, and because of the unique design, there are multiple ways to sit in this chair, allowing for maximum comfort and versatility. The ingenious design of the Rise seating area takes group projects to a whole new level. Literally- the three tiered structure of the Rise allows multiple people to sit and chat, without taking up a whole room. Another leading office furniture manufacturer, ABCO creates unique product designs that help give modern office spaces a more contemporary, sleek aesthetic. New from ABCO is the Z-Series; a line of all new tables designed to bring life to any classroom or conference room setting. The lightweight yet sturdy tables are built on wheels so you can easily take your meeting anywhere you need to be. ABCO’s philosophy is that office furniture is the basis of productivity and creativity in an office. If the furniture reflects creativity, employees are more likely to carry that creativity with them in their projects. This philosophy certainly comes through in the Z-Series. For these new lines of products, and many more, visit Workspace Solutions. Not only have we been helping businesses around the Fort Wayne, Indianapolis, Warsaw, and South Bend areas furnish their offices, but we also have great office planners and designers on hand to help you maximize creativity and productivity! Whether you are looking to add a more modern appeal to your waiting room, or you just need to update your space with more modern office furniture, Workspace Solutions can help you bring your business into the 21st century.